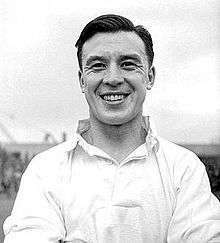 Frank Soo (12 March 1914 – 25 January 1991) was an English professional football player and manager of mixed Chinese and English parentage. Soo played as an inside forward in the Football League for Luton Town and Stoke City. He was first player of Chinese origin to play in the Football league, and the first non-white player to represent England (in unofficial wartime matches). After ending his playing days at non-league Chelmsford City, he went on to coach various different European clubs in the 1950s and early 1960s. He was particularly active in Sweden, managing Eskilstuna, Örebro, Djurgårdens, IK Oddevold, AIK, Köping IS, and IFK Stockholm. He also coached Italian club Calcio Padova, English clubs Scunthorpe United and St Albans City, Norwegian side Fredrikstad, and also coached Norway at the 1952 Summer Olympics. He coached Djurgårdens to the Allsvenskan title in 1954–55. Soo was born in Buxton, Derbyshire, and brought up in Liverpool. His parents, a Liverpool-based Chinese sailor father, Our Quong Soo (can also be transliterated as Ah Kwong Soo), and an English mother, Beatrice Whittam, had married in Chorlton, Manchester in 1908. Frank had an elder brother (Norman) and several younger siblings (Phyllis, Ronald, Jack, Harold and Kenneth). By 1920, the family had settled in West Derby, Liverpool. His brother, Ronald, was killed on 14 January 1944, while serving as an air gunner in No. 166 Squadron. He is buried at Hanover Cemetery, Germany. Having later lived in several countries, his address at the time of his death was given as New Cheadle Hospital, Cheadle, Staffordshire. Soo began his career with Cheshire League side Prescot Cables, whilst working as an office clerk. He moved on to Stoke City in January 1933 after being spotted by the club's scouts. He made his debut on 4 November 1933 away at Middlesbrough, making him the first player of Chinese descent to play in the Football League. He was a very good crosser of the ball whose deliveries were 'inch-perfect' and the half back line of Soo, Arthur Turner and Arthur Tutin, provided Stoke with a fine midfield in the 1930s. The "Potters" competed in the First Division, and came closest to winning the league when they finished fourth in 1935–36, nine points behind champions Sunderland. Soo was a regular in Bob McGrory's side and was appointed captain for the 1938–39 season before the league was cancelled due the outbreak of World War II. During the war he served for the Royal Air Force. He also guested for Newcastle United, Blackburn Rovers, Everton, Chelsea, Reading, Brentford, Port Vale, Crewe Alexandra, Millwall, and Burnley, and played nine times for the England national football team between 1942 and 1945 (in Wartime and Victory Internationals), the first non-white person ever to play for the national team (albeit in semi-official matches only) and the only person of East Asian descent to date. He also played for several FA representative teams not officially described as "England". His rising fame did little to endear him to Stoke boss Bob McGrory, who had a "pathological dislike of star players". In September 1945, after playing 173 league games for Stoke, Soo moved to Leicester City for a fee of £4,600, rejoining the manager who had signed him for Stoke, Tom Mather. He left Filbert Street before the re-introduction of the Football League, and moved to Luton Town in July 1946 for a fee of £5,000. He played 71 Second Division games for Dally Duncan's "Hatters", before leaving Kenilworth Road to join non-league Chelmsford City directly from Luton for a reported fee of £2,500. He helped Arthur Rowe's "Clarets" to finish second in the Southern League in 1948–49, before new boss Jack Tresadern led the club to a fourth-place position in 1949–50. Soo made 82 first team appearances for the club and scored ten goals, mostly directly from free kicks. Soo was noted for his ability to deliver perfectly placed passes. In April 1951 he was appointed as manager of Italian club Padova, but left his post after the club were relegated out of Serie A in 1951–52. Later in 1952 he became coach of the Norway national football team, and coached them at the 1952 Summer Olympics in Helsinki. He later managed Swedish side Eskilstuna, taking over at Örebro in 1953, Djurgårdens in 1954, IK Oddevold in 1956 and AIK in 1958. He took charge at Djurgårdens for the 1954–55 season, and instigated a highly effective physical style that won the club the Allsvenskan title in his one season in charge. In June 1959 he was appointed as manager of Scunthorpe United, but left in May 1960 after his one season in charge had seen Scunthorpe finish a respectable 15th in Second Division. Afterwards he had a spell as manager of Isthmian League outfit St Albans City. He subsequently returned to Scandinavia, taking over as coach of Köping IS in 1962, IFK Stockholm in 1963, Fredrikstad in 1964 and AB Copenhagen in 1965. He later coached a number of teams in Copenhagen and Malmö before taking over as coach of Höganäs BK in 1972. 1 2 "Soo, Frank". Free BDM. Retrieved 1 March 2016. 1 2 3 Godfrey, Mark (29 February 2016). "The Wanderer – Just who was Frank Soo?". The Football Pink. Retrieved 30 August 2016. 1 2 3 4 5 6 7 8 Matthews, Tony (1994). The Encyclopaedia of Stoke City. Lion Press. ISBN 0-9524151-0-0. ↑ SOO, RONALD, Commonwealth War Graves Commission, cwgc.org; retrieved 2 June 2010. 1 2 Matthews, Tony (18 December 2008). The Legends of Stoke City. Derby, United Kingdom: Breedon Books. pp. 170–71. ISBN 978-1-85983-653-8. ↑ Kent, Jeff (1996). Port Vale Personalities. Witan Books. p. 275. ISBN 0-9529152-0-0. ↑ "International caps". rsssf.com. Retrieved 16 December 2012. 1 2 Stoke City 101 Golden Greats. Desert Islands Books. 2002. pp. 88–90. ISBN 1-874287-55-4. ↑ "Stoke City legends: Frank Soo". The Sentinel. 10 August 2010. Retrieved 16 December 2012. 1 2 Colon, Paul (18 June 2013). "Djurgården And Hammarby: A Moving Story - TheInsideLeft". TheInsideLeft. Retrieved 1 November 2016.